This year, Tubby had to spend his birthday with a broken leg in a cast, so I'm sure it'll definitely be one for him to remember! Initially he didn't wanted to celebrate it as he was just feeling really grumpy with his immobillity. But I figured that he needs to go out for some fresh air instead of cooping himself at home all the time and so I planned a last minute dinner at Wah Kee for him and invited a few friends who could make it. He was of course delighted when he saw them and the kid in him came out when he started to take the stuff out to assemble. We were joking and talking about our Rumpus room in future - where there will be a room full of Transformers, Lego and Thomas the Tank. LOL. They were smart in that a lot of the sets didn't have enough tracks to make a larger and more decent rail road display and so I had to get him another box of the Beginner's Expansion pack with a variety of more tracks so he could come up with this. Dinner at Wah Kee - Early celebration of his birthday on Sat 14 Aug. Thanks to those who could make it with last minute notice. :) Everyone was digging into the yummy food after waiting and being all hungry already! Weichao and Tubby share the same birthday - exact date of 18 Aug, just a different year. Here are the two birthday boys with their Strawberry Cheesecake from Fergurson Bake house in Southland. And these were the people who helped make a dinner a yummy and full success. :) From L-R: James (our tennis mate and wedding preshoot Photographer! ), Jason and Michelle, Weichao and Alex at the top row. Mr. Yeo making a wish and blowing out the candles. They were melting onto the cake real fast! Here he is again, looking into his second installment on presents which he got and laughing with glee as it was something else that he wanted! I love this shot! And these were the presents: new Ralph Lauren Big Pony fragrance. They came in numbers 1 to 4, but they ran out of 3 and 4 smelt really musky. So I took 1 and 2 instead. Dan bro and I also set up a stall at the Malvern Collectibles Fair last Sunday 22 Aug at the Malvern Town Hall. Boy it was a real tiring and long day as we had to be there by 7.30am and be ready by 9am when the doors open. 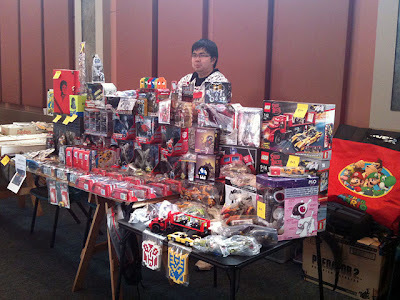 His friend Casey also shared the stall with us selling Hot Toys figures. I was really disappointed as I didn't make any sale at all, can you believe it?! 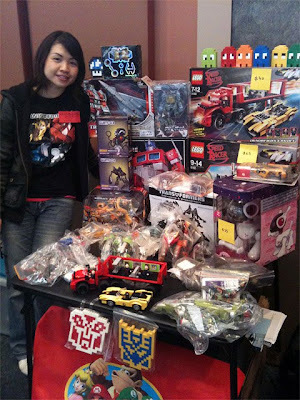 Some lady bought a $260 Michael Jackson limited addition Hot Toys figure from Casey and Bro sold a couple of Transformers figures and some of his custom Lego creations, while I got zilch! :( Most of the people were into cheap bargains and the audience weren't quite right. I also felt that the organisers didn't make enough effort to bring more people to the fair too. Boo! Me at the booth with the initial set up - I brought this extra foldable table along so that we could put more stuff on it. Here you can see lots of Transformers figures and accessories, Lego sets and the talking MIO pup that I was selling. Dan bro here making a grumpy face when I was taking the photo haha! We later decide to merge my foldable table and the table that was provided by the organisers so that people walking by wouldn't miss anything and be attracted to it. But alas, that didn't really make a difference too. :( Anyway we might possibly try the other larger toy fair that's coming up at Sandown next month instead! I also went to Diana's post birthday celebration - a dinner in city and KTV session after that. I couldn't stay for long as I had to get up real early for the fair above! Didn't have pics with me as all the pics were on D's camera. But we had fun and I really missed singing ktv! Oh and Mum's also going with me to bring my pre-shoot gown for alterations tomorrow! Hope they don't charge me heaps and I can get it back soon so that Mum can personalise it! :D And that's pretty much the month of August for me!